I love to try out new restaurants, and recently Candee, Debbie and I found an Egyptian restaurant in Harrisburg, Pennsylvania. that we just had to try. The name of the restaurant is Sphinx of Pa and is the only Egyptian cuisine in Central Pennsylvania. The restaurant is owned and run by two really nice people by the name of Hanan and Mike. They went out of their way to explain the items on the menu and offer suggestions on what to eat. After much deliberation, Candee and Debbie decided to start off with the appetizer platter which included Sphinx salad, tehini, side salad, hummus, tabouli, and baba ghannoujj. There were wedges of pita served with the platter, and we all enjoyed sampling the various items. For her entree, Candee ordered the Sphinx platter which included Kofta, Chicken Shish Kebob, Shawerma Beef, Shawerma Chicken w/Rice or Spaghetti & any Salad and sauteed vegetables. 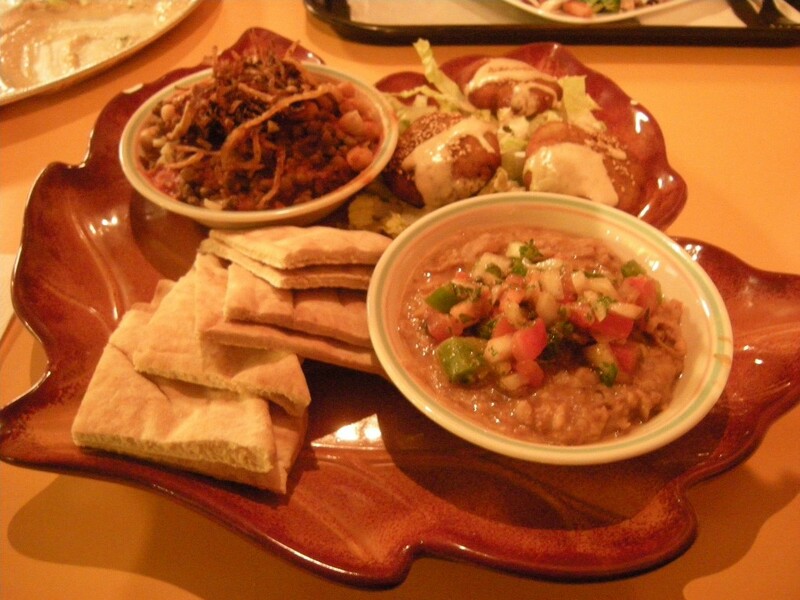 Debbie ordered the Vegetarian Sphinx platter which consisted of fava beans, koshary, and falafel…yummy! Below are descriptions of some of the dishes, because if you’re like us, you’re probably not sure what some of the dishes are. Sphinx salad-chopped tomatoes, parsley, peppers and red onion. baba ghannoujj-A purée of roasted eggplant and tahini, flavored with garlic and lemon juice. kofta-a dish of spicy meatballs or kebabs that are grilled, fried, or put in soup. koshary-a traditional Egyptian meal that consists of a strange combination of macaroni, spaghetti, rice, black lentils, chick peas, garlic sauce and a spicy tomato chili sauce, all topped with fried onions. 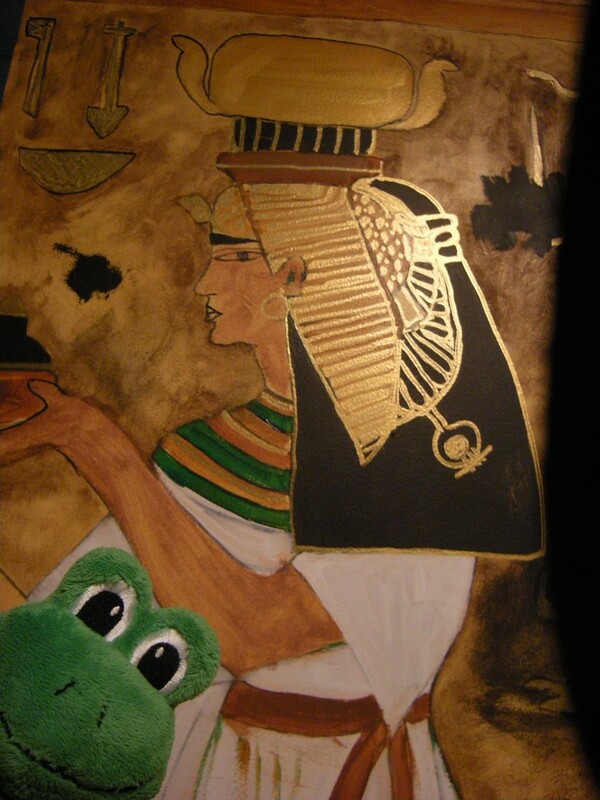 The walls of the restaurant are covered with Egyptian murals that were painted by a friend of Mike and Hanan. The murals really add to the atmosphere and enhance your dining experience. We were very impressed with both the food, and the service and would love to go back sometime for another meal. 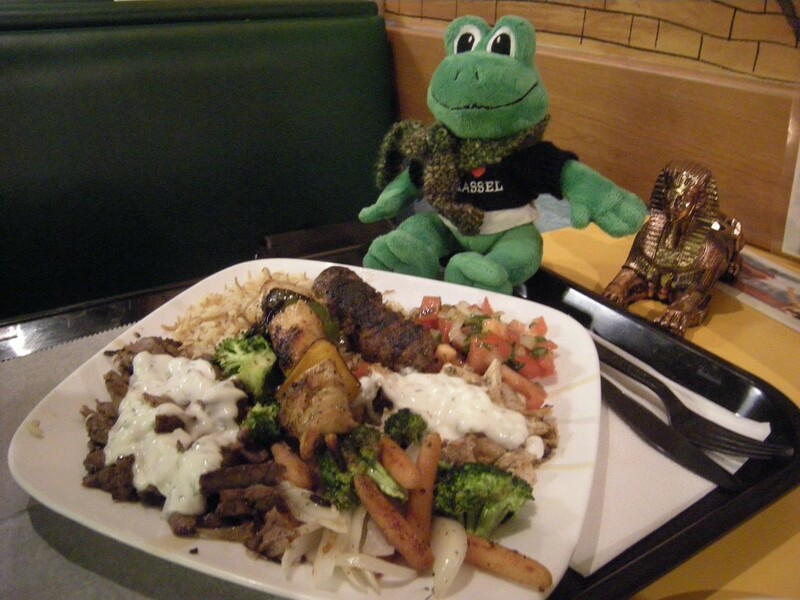 The restaurant is located at 2810 Paxton Street, Harrisburg, Pa.
That’s some tasty-looking food! I can’t wait to go to an Egyptian restaurant!